This was one hop that I really thought that I was going to have to skip. This hop is the brainchild of Heather of HumbleBeads and Lorelei of Lorelei's Blog. The idea was that all the participants would go to Micheal's and pick up some preselected beads. Then we would share what we made with them today. Well since money has been tight around here, I wasn't going to be able to play. That all changed last Thursday when a friend of mine, Rita of Jewel School Friends, sent me some of what she had picked up to play with. It was a total surprise and I was walking around with a smile on my face for the rest of the day. I went simple with a necklace for this hop for a couple reasons. For one, I wanted one for myself in honor of the kind gift. I also wanted it to be adjustable since I tend to layer my necklaces. The second reason is that I have been having issues with my stomach due to the pain pills I was on after breaking my toe. So I wasn't able to spend a lot of time in the studio playing with it. I also want to apologize for the pictures. As I was waiting for that perfect time to get pictures, we had a storm blowing in. So I snapped a couple rather quickly outside while I was fighting with the wind. It really does look much better in person. The picture above is one I took on Monday when I wore this necklace into the office. It's lightweight and really comfortable to wear. 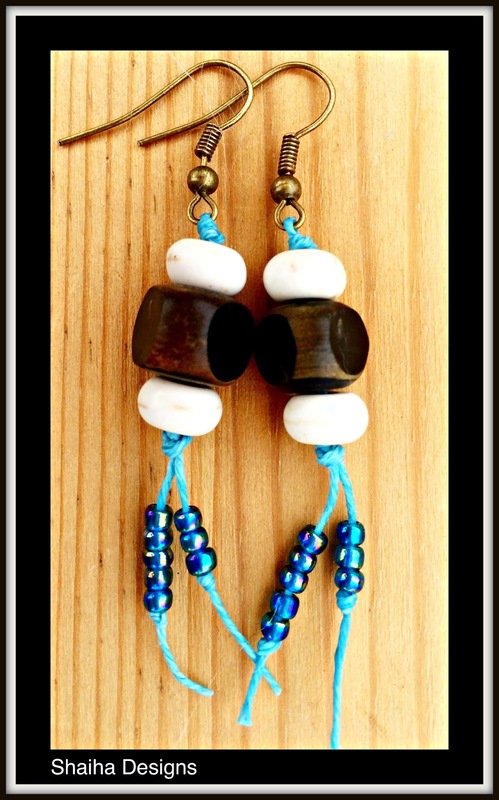 I also made a pair of earring with the last of the wooden beads and a couple of the white beads that Rita sent to me. This pair will be donated to Ears To You. Now there are several folks taking part in this hop so be sure to click here to check out what everyone else has done. I am quite sure that you will see some real eye candy that will blow your socks off. Simple and sweet! 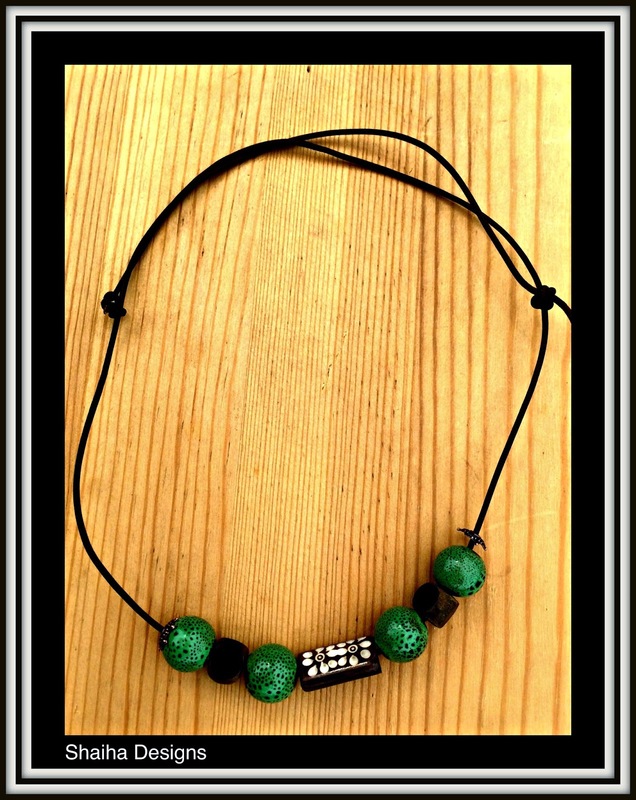 The wood flower bead makes a perfect focal. Oh I'm so glad you were able to play! Cool adjustable necklace. I need to check out the Ears to You..so cool that you'll be donating them. Enjoy the hop!! Trust me I know what it's like to have a tight wallet, mine is the same these days! Glad you were able to play along with us. I love your necklace design, and can imagine it would be a great "everyday" necklace for the Summer!! Cute earrings too- and good for you for donating to a great cause! 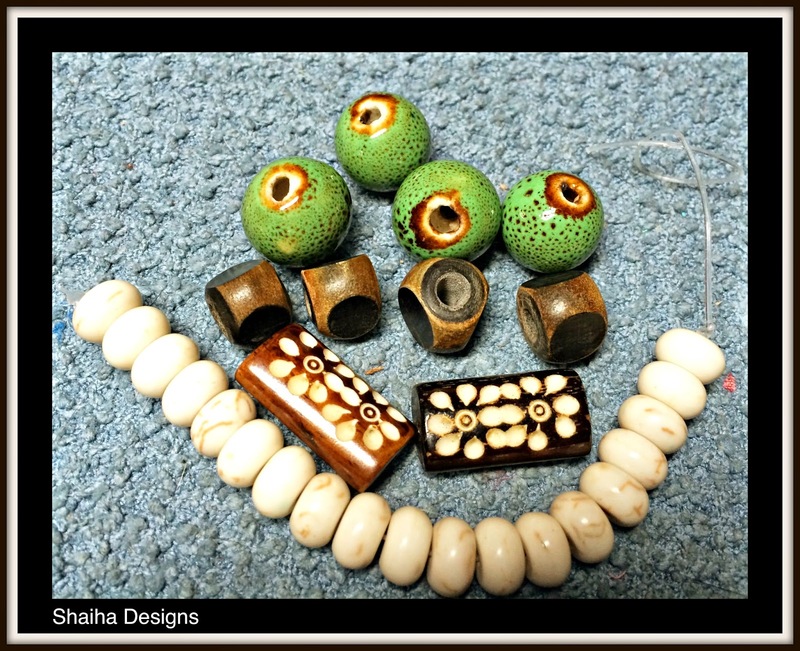 It was so sweet of Rita to send you some of the beads to play with. I love the necklace. It looks like it would be so versatile and it's awesome that it is adjustable. The earrings are awesome as well. I love the blue cord and beads. What a cute summer necklace! I particularly love the earrings, though, especially with my recently-developed obsession with cord! How nice that you are donating them - great idea! Shia I like your necklace. Often times simple is best. I read an email from Margie Deeb today that talks about how lots of people think that more is better but more does not make better designs. Your necklace seems to fit that perfectly. That was very generous of Rita to send you the beads. God Bless good friends! I loved them. I'm so happy you were able to play along. I've been enjoy on wearing simple knotted leather necklaces this summer too! Thanks for sharing about Ears to You - what a great cause! I think the photo looks great so I'm sure the necklace looks fabulous! I really like the way you made the necklace adjustable so it can be more versatile and the earrings are super cute! Love these! I'm really diggin' these earrings - they are my favorite! What a wonderful gift for yourself it turned out to be! 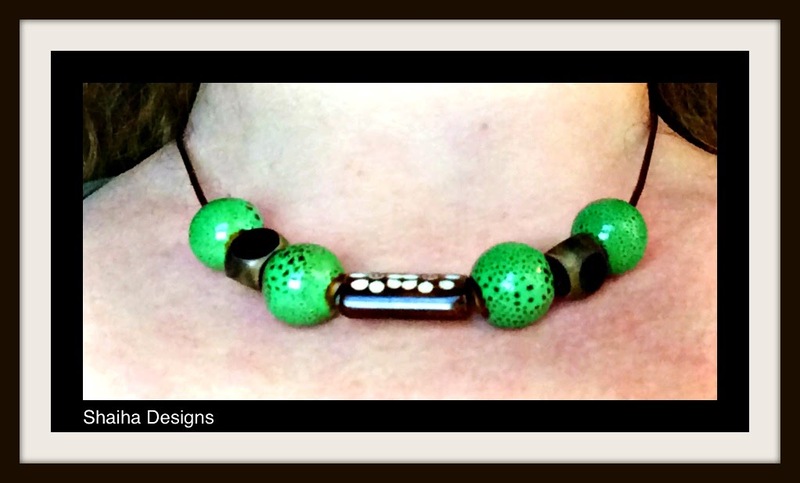 I do love the green ceramic beads and you did them justice with your creation!